There are seven Emirates that make up the United Arab Emirates (UAE) stretching along the Arabian Gulf coastline of eastern Arabia. Abu Dhabi is the largest and is also the Emirates capital but is more conservative than the second largest city - Dubai which boasts the tallest building in the world at over a quarter of a mile high! A little further along the coast is the Emirate of Sharjah, which is one of the smallest of the seven Emirates. The independent transport videos cameras concentrated on the three aforementioned Emirates for the purpose of this programme. 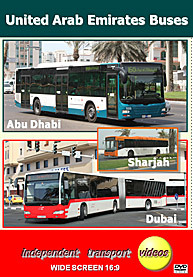 The Abu Dhabi bus fleet is dominated by ‘MAN Lion’s City’ buses in a blue and white livery for local services and ‘MAN Lion’s Regio’ coaches in either the blue or a red livery for longer trunk routes to the other Emirates. Sharjah has an orange and white livery for its smaller fleet, with MCV bodied Mercedes being its latest arrivals. Dubai on the other hand has a very large fleet in a smart off white and red livery. They are operated by RTA, the Roads and Transport Authority. This varied fleet includes three axle Neoplan double deckers, Mercedes-Benz Citaros and Solaris Urbinos in rigid and articulated form, Neoplan single deckers and new VDL Citeas. A large fleet of Sunsundegui bodied Volvos run the very frequent express services to the other Emirates branded as ‘Emirates Express’. Our filming starts in Abu Dhabi at Al Markaziyah then moves to Marina Mall a busy shopping and leisure area where a number of services terminate. The next location is at the main bus station and outside it on the busy East Road where all types can be seen in action as well as coaches from Sharjah Transport in their smart orange and white with blue trim livery. From the city centre we move back to Marina Mall for more action. We then make a brief visit to the Emirate of Sharjah and film at the bus station. Unfortunately we had to cut short our filming due to a ‘haboob’ – sand storm which is not conducive to sensitive filming equipment! We make up for this shortfall in Dubai. Filming starts along Baniyas Road on our way to the small but interesting Sabkha bus station. From the waterside at Bur Dubai we then film in and around Al Ghubaiba bus station. The Gold Souq bus station is our next venue, where we catch up with a former London Transport Leyland Titan with the ‘Big Bus’ fleet, as well as a number of coaches that have travelled the desert roads from far and wide. We take a ride on a Solaris articulated bus to Union Metro station. After more filming around the city we travel on Sunsundegui bodied Volvo E6257 (B-89744) back to Abu Dhabi. An interesting ride as we run alongside the new Metro and see the scenery change to desert before the buildings of Abu Dhabi start to appear. Another visit to the bus station before our final scenes along 18th Street and the Corniche bring our Middle East adventure to a close. Duration : 106 minutes (approx).